"The Premiere Counter Culture Business Event"
Champs Trade Show is an international platform featuring industries for a counter-culture trade event. The event offers a wide variety of products and services from industries and businesses in all fields from jewel industries to art industries. The event also conducts various gaming competitions for visitors and exhibitors to participate and conquer the game by becoming the master of the flame. The event aims at targeting non-production products and gives opportunities to newly establish start-ups and businesses. Check in sucked. There was no clear line for us to wait in. One registration said bar code line. We didn’t receive our barcode until 7pm the first day.of the show. We waited in the wrong linefor 1.5 hours. I finally went to the barcode booth and asked where mine was since I never received it. I was able to check in. It was very stressful and annoying. Why wasn’t anyone from the show there directing buyer traffic? Great experience. Great vendors. Lots of new products. The best. Time well spend. See you in next SHOW. When we arrived to set up the day before the meeting, our tables were not at the booth, so we had to leave our boxes behind a curtain. The next morning, several thousands of dollars of our product was stolen and the event and organizers takes zero responsibility. 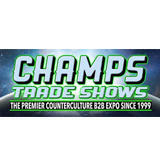 Champs Trade Show having around 420 exhibitor booths and encompassing 140, 000 square feet of floor space, this event will bring in manufacturers, producers and suppliers of tobacco and tobacco accessories, hand blown glass, clothing and specialty gift items. These exhibitors will be able to connect with retail and wholesale buyers and thus make their products known in the industry.